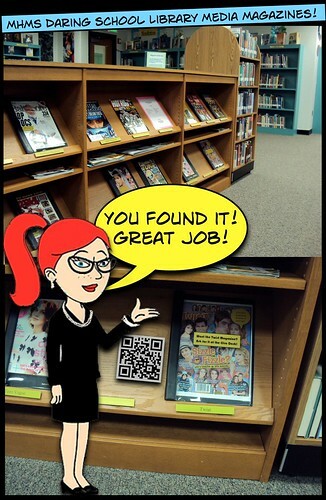 QR Code Quest Scavenger Hunt – Part DEUX! 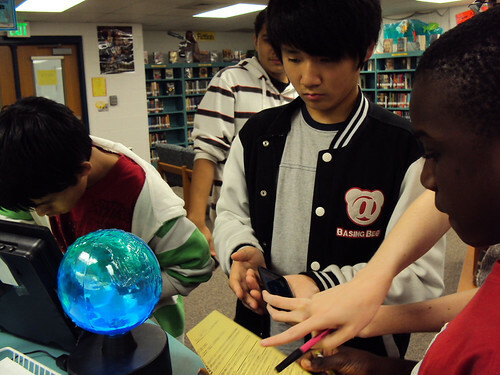 It has been a busy & exciting year at the Daring MHMS School Library! So busy, I sometimes can’t find the time to blog about all the cool stuff we do – now it’s time to catch up. We updated & improved our QR Code Quest Scavenger Hunt lesson this year & used it again with our AWEsome ESOL kids & 6th graders. 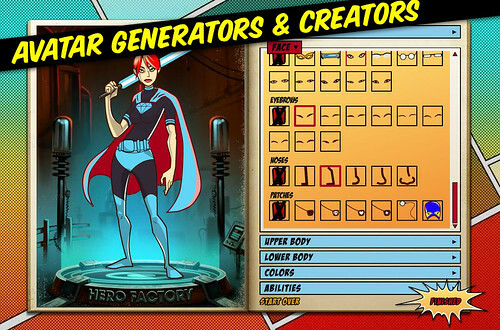 Improved worksheet and graphic clues! 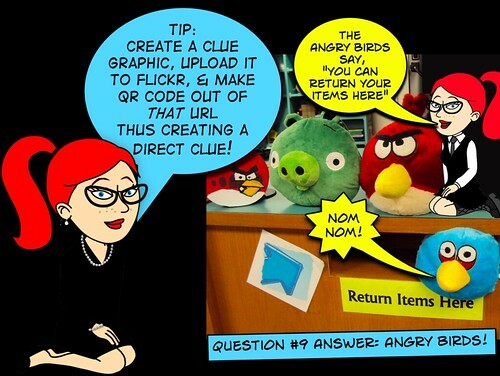 I blogged about this lesson last year and upon reflection found that I needed to make the scavenger hunt questions simpler & the clues more graphic. (click photo at left to see a larger size) In doing so, I also had the chance to (finally!) make an avatar for my long time (20 years!) amazingly long suffering (she has to put up with me! LOL) angel of an assistant Mrs. Black! 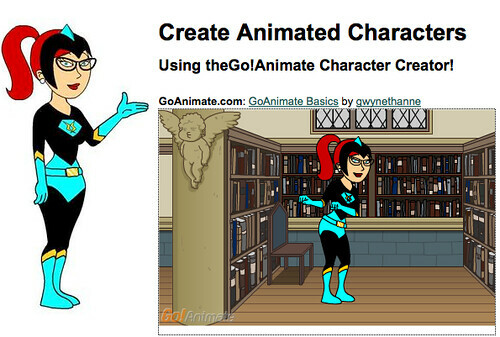 After I created it on Go!Animate Character Creator (Comic World) I then Photoshopped it adding the University of Maryland Terps logo onto her cute red t-shirt because she’s a U of M alum & a super fan! 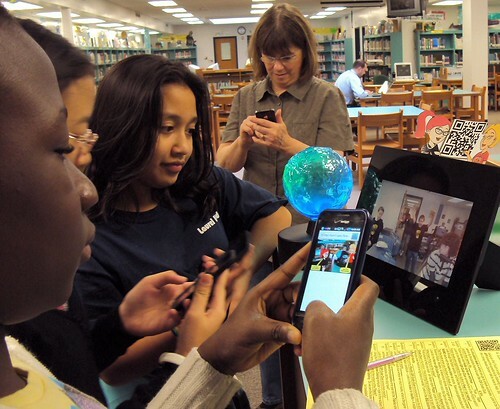 This lesson is an example of how you can use mobile media in your school, classroom, or library. I can easily see how you could adapt this to say a SCIENCE! class, math class, or just about any subject area! 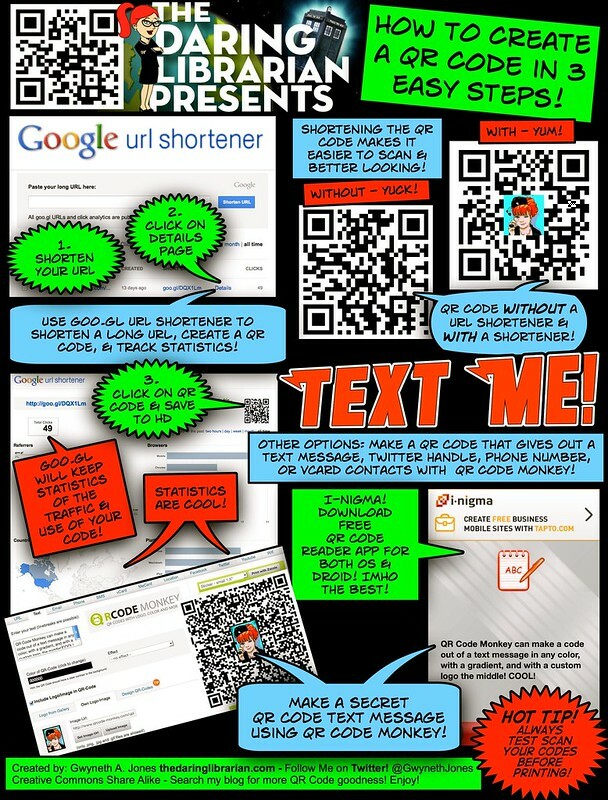 The QR codes are included in the last pages of the lesson so you can see how they work. 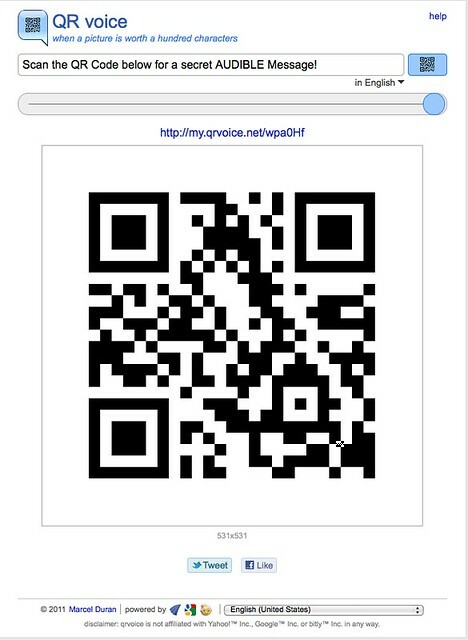 Also, don’t forget my favourite FREE & platform friendly QR Code reader is inigma. Download the new QR Code Quest Scavenger hunt lesson & worksheets by clicking the lesson header below to get to the lesson wikipage below! 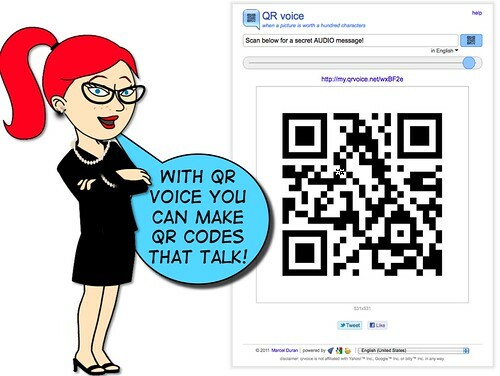 QR Voice adds a super neat new addition to the QR TEXT message. Just make sure the kids have the sound up on their mobile devices OR BETTER YET… next to the QR code station have a pair of computer speakers (or headphones if you fear the ruckus) that kids can plug into so the QR voice message can be clearly heard. 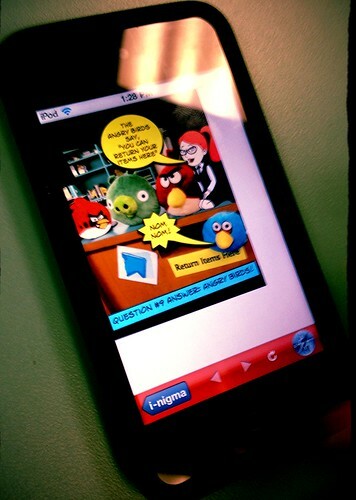 Question 9 features our favourite fuzzy friends the Angry Birds! Learning where the important physical parts of our library was the main objective for this lesson, as well as introducing library vocabulary words. 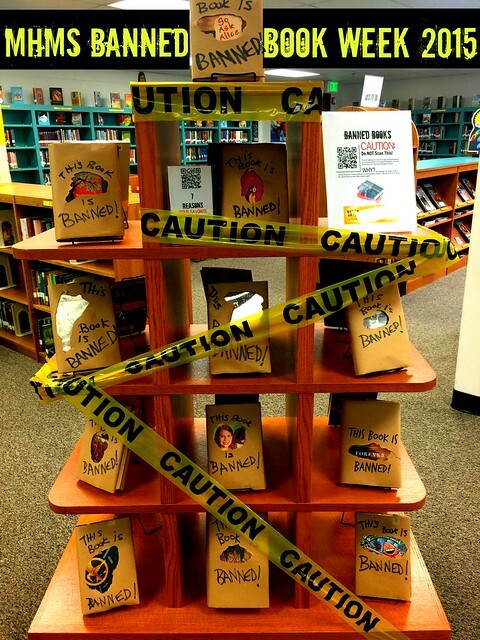 It’s a super fucn way to teach new kids, 6th graders, and my ESOL kids how to locate important parts of our library including the circulation desk, return book drop, reference & encyclopedias, and our magazines. I was really bummed that one of our favourite and most popular magazine Shonin Jump has ceased printing a hard copy. Our other popular magazines are Twist, Teen Vogue, & of course Sports Illustrated. At the end of the class when we had some time left over I handed over my iPad & we played Angry Birds & Plants vs. Zombies together! 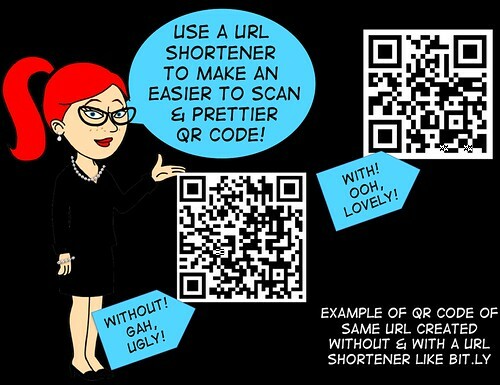 Unless you’re making a QR Text message using Kaywa using a URL shortener like my faourite Bit.ly makes for a prettier & easier to scan code. 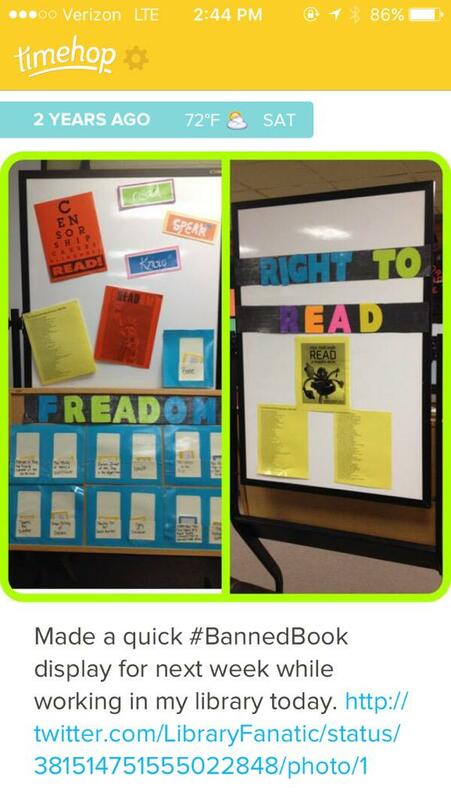 For more teacher tips read this posting on my professional blog. See below for ALL the pictures of our AWESOME kids doing this activity. We had a visitor to our class that day, an ESOL instructional specialist from my district board – so that’s the guy in the background with the camera. 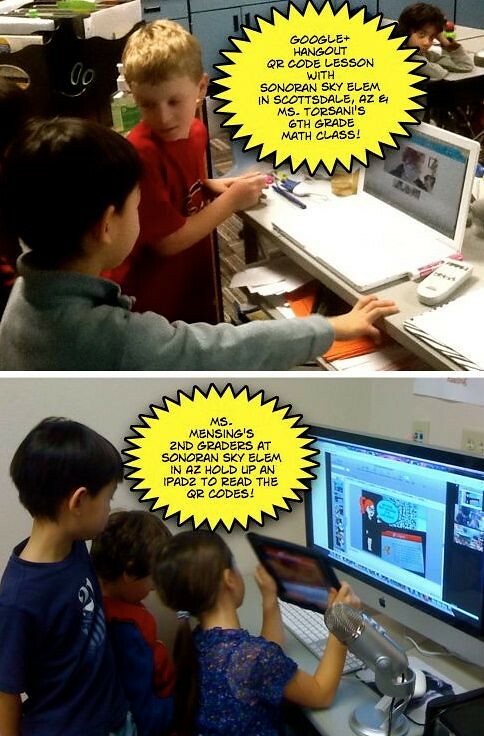 Photos are by him and my awesome partner in teaching Mrs. Linda Potsiadlo our AMAZING ESOL teacher. I mean, this chick rocks & I love working with her! 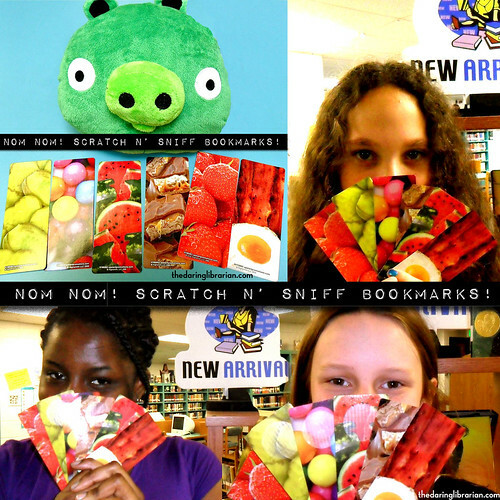 For all that my kids LOVE QR Codes, mobile media, & tech — they GO CRAZY for Scratch N Sniff bookmarks from Highsmith! 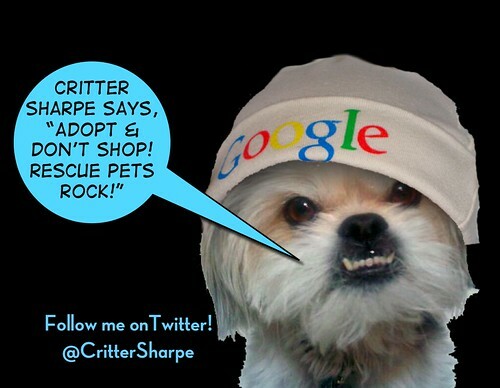 And a final PSA from my dear friend & super fan, Miss Critter Sharpe! 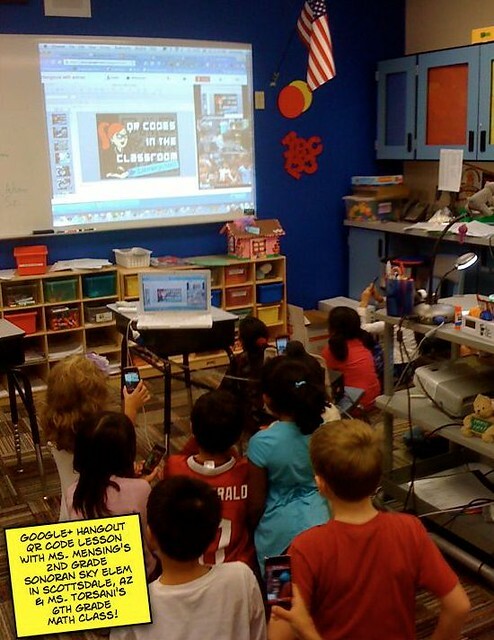 We had an exciting day last Friday when we used Google+ to hang out with the 2nd grade gifted inclusion kids at Ms. Mensing’s class from Sonoran Sky Elementary in Scottsdale, Arizona! Whew! That’s a mouthful! But these kids were AWEsome! 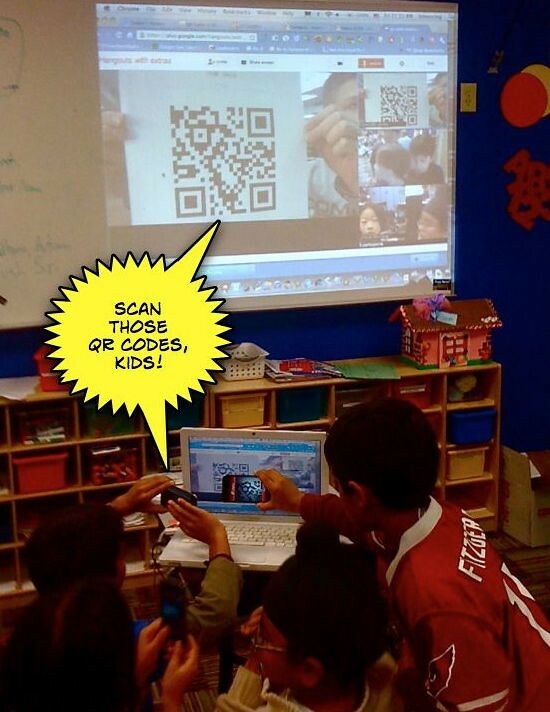 I taught a brief lesson on QR Codes in the Classroom (and Library!) 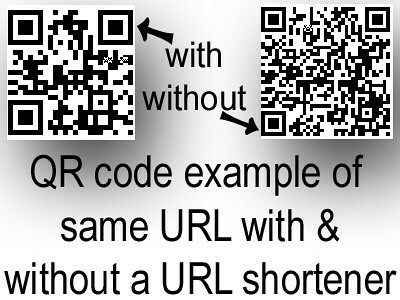 all about where QR Codes came from, how they are different than regular bar codes, and how they are being used all over the world to transmit information like Text Messages, Video, and URL Web links via Mobile Media! 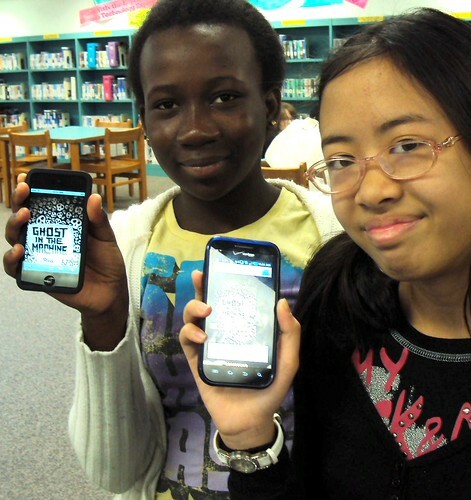 Ms. Mensing’s kids scanned the codes using both iPod touch generaton 4’s (like we have here at the MHMS Daring School Library!) and iPad 2’s! (we don’t have any of those yet, but I brought mine in!) they were very engaged with the learning and it was a lot of fun! 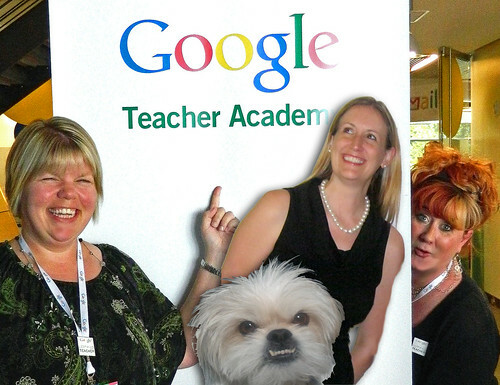 Ms. Mensing and I became friends when we were both at the Google Teacher Academy this past summer in Seattle Washington. That’s her next to me & Miss Critter Sharpe (and another teacher friend) She’s the one with the long blonde hair & fabulous pearls! I’m peeking out from behind the sign – NINJA Style! 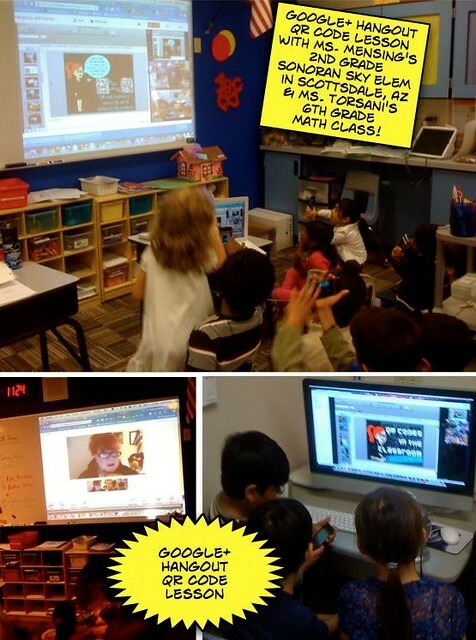 We had a great time learning together and I’m so glad we could use Google+ to hang out with our kids. Then…this week I got the BEST PRESENT EVER in the mail! 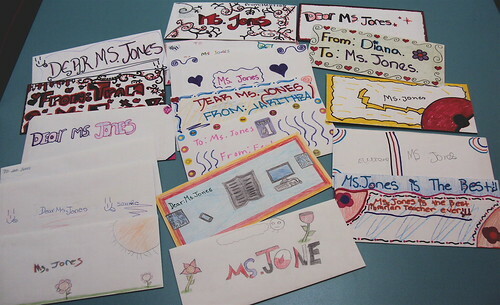 A big envelope of drawings & letters from Ms. Mensing’s class! SQUEE! See ALL the cool pics here!Most were taken by Mrs. Mensing, Thank you for your permission to use them, hon! Thank you Ms. Mensing & Ms. Torsani for an amazing video chat adventure! 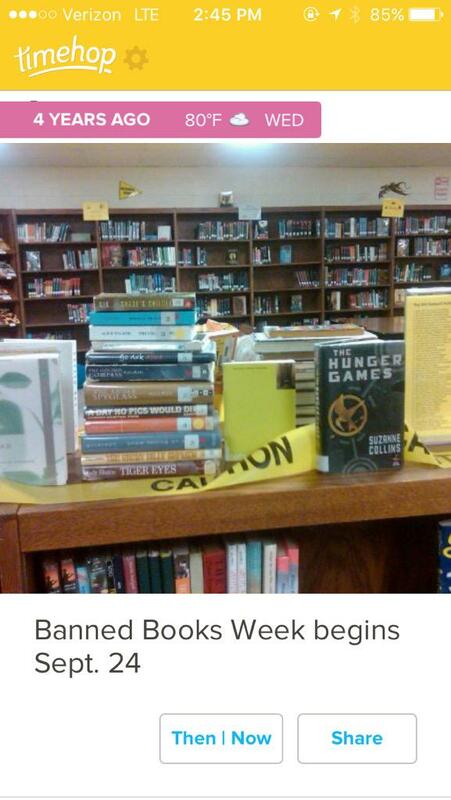 We’re gonna have to do that again! Hmmmm next time MATH!??? I re-worked some of the questions for a lesson with Mrs. Potsiadlo’s adorable ESOL class. I like having clues that are cute, easy to follow, and visual. 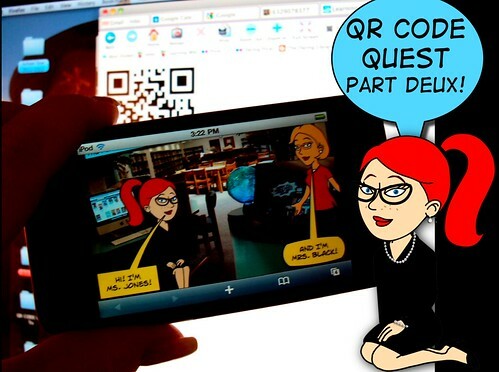 I want our kids to have fun & feel successful with this QR Code Quest! 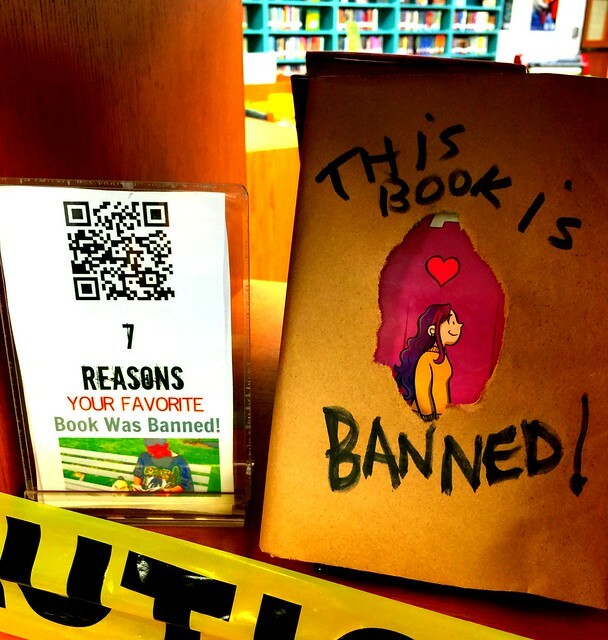 You can also use this lesson for Library Media orientation, or even re-mix the questions, QR Codes, & hints for just about ANY subject area! First I created the Hint. 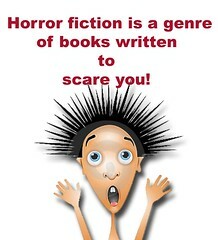 For my kids who are learning English I thought it would be better to combine the hint with pictures. 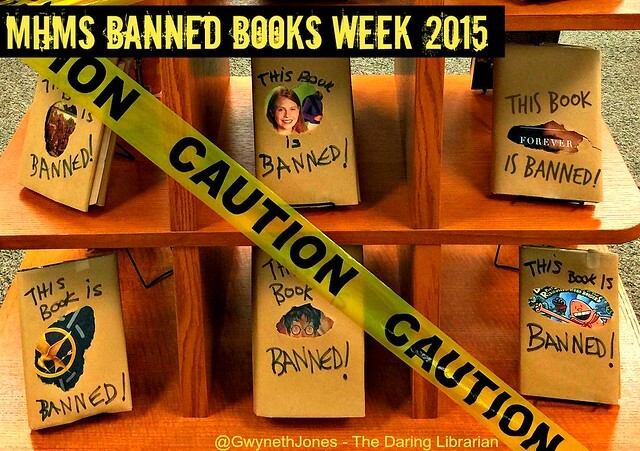 So I combined Creative Commons images with clearly worded hints – but I also wanted to add in some key words that we’ve been working on like genre, fiction, nonfiction and title. Multi-step clues & questions were important, too. To give a little insight on how this lesson was created I’ll go through questions 6-8 which all had to do with Italian cookery. In Question 6. I wanted them to find two of our Italian cookbooks in the 641 section of Nonfiction. I found online pics of the exact two cookbooks we have in our collection, combined them with a sporty red & white checkered cloth jpeg, a pizza, and the hint. Putting this all together with photoshop, I saved this as a .jpeg & uploaded it to Flickr. Taking the Flickr .jpeg URL of this pic I pasted it into Bit.ly to get a shorter URL (that makes an easier to scan or read & prettier QR code – more on that below in the Tech Tip section!) Now with the shorter URL it was time to open another tab on my browser and go to my favourite QR Code generator, Kaywa which makes terrific codes in S, M, L, & XL sizes of any URL, text message, phone number or SMS! 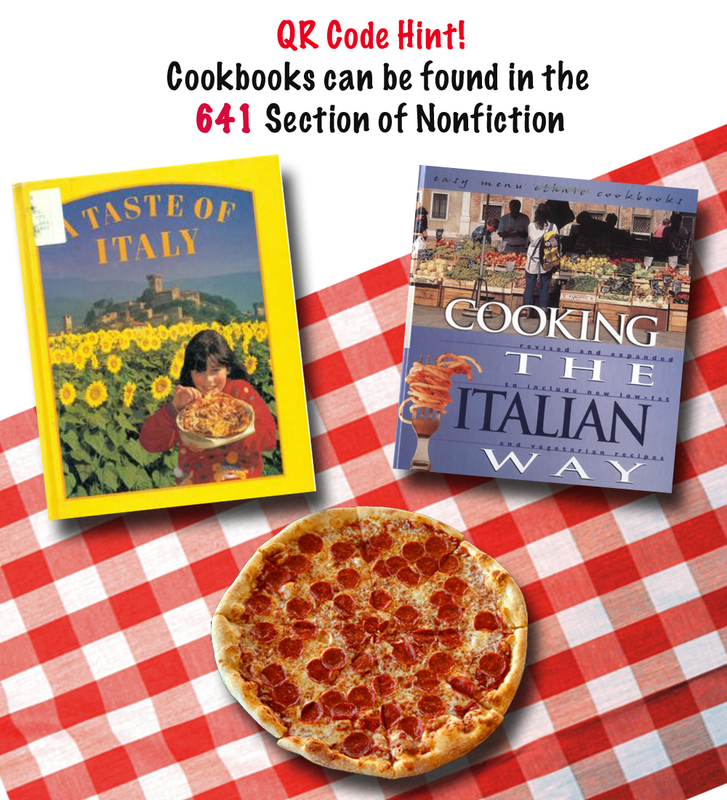 Back to the Italian cookbooks – I taped the laminated QR code hint with the pics of the cookbooks really close to the 641 shelf & they had a great time finding it by both number & sight! Question 7. Then I wanted the kids to locate and use our big unabridged dictionary on the swively stand & while we were there point out the other dictionaries (including all the foreign language ones we have!) 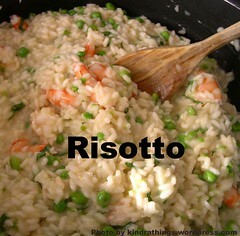 I chose Risotto for them to look up because it was a word covered in both of my Italian cookbooks, it’s not obvious like Pizza, and I thought some of my kids would recognize a risotto & translate it to “arroz con camarones.” The QR code with the visual hint was taped on the globe next to the dictionary. The kids identified it right away! Visit our Edublog award nominated Daring Steam-Powered Wiki to download the MS Word Worksheet in both .doc and .pdf format with the QR codes or visit my QR Code Quest Flickr Gallery for all the .jpegs and pics of the kids scanning & learning! The codes that the kids scan are NOT the ones on the side of the worksheet next to the questions…those are just for purty! The QR Codes are on pages 2-4 – I also created a test scan page for fun & to get them used to focusing and grabbing the QR Code. 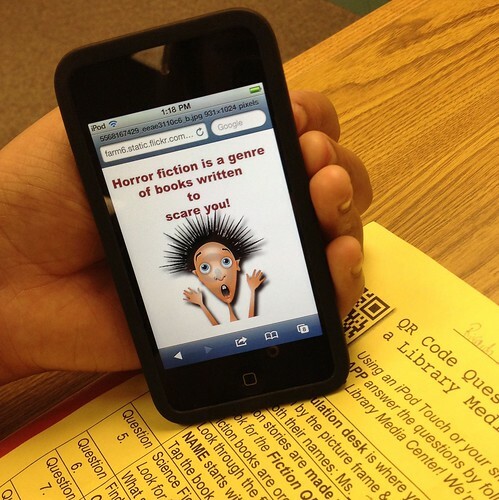 During the class we scanned the codes using our iPod Touch Gen4. I really like the i-nigma FREE barcode scanner available on both the Apple & Droid markets – it scans great & auto launches URL. 2. Not only is Bit.ly great for shortening URL’s they keep stats on the links you share! All you have to do is to click on Info Page+ and you can see how many people followed your link & when. Another COOL tech tip! 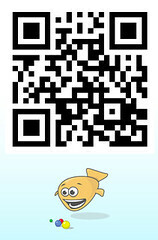 Add a .qr on the end of any Bit.ly URL and you will get a QR code! 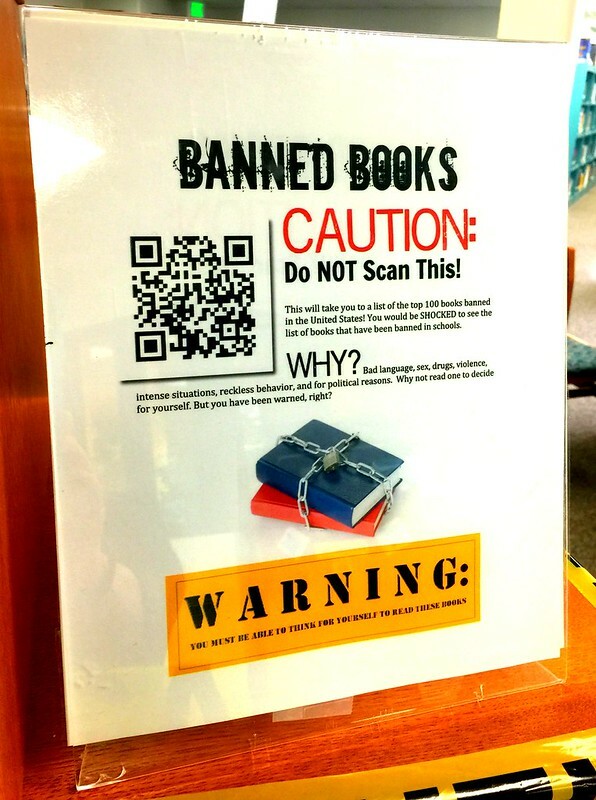 Now these aren’t big enough for me – that’s why I use Kaywa which offers XL codes which are better for posting around the library….but still it’s neat! BEST Presents in the World! 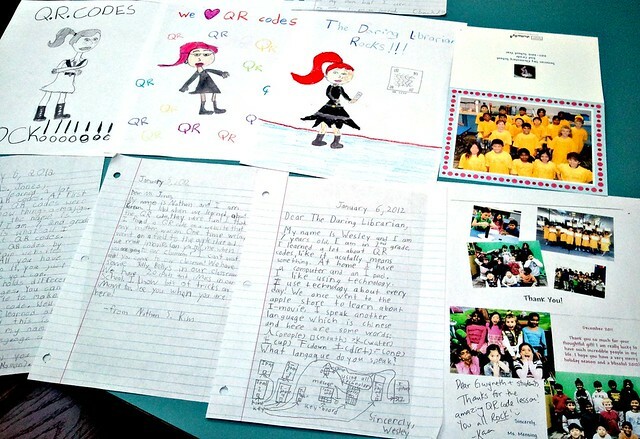 Thank you notes from my adorable ESOL kids! I’m SO keeping these for a rainy day!!! !